The INT switches are trival. Just put one IRQ, a free one, ON. SHR is only on if you want two 4Ports to share the same interrupt. Make sure they use different address ranges (XA0). INT is only off if you want to use the card with your own, polling based, routines. 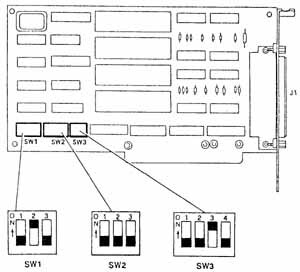 XA1 selects the mode of the J1 & J2 port: as COM1 & COM2 or as special ports, just as J3 & J4. Check your own inittab for other examples! My cable has the connectors numbered J1 to J4 for the individual ports and J5 for the card connector. J1 corresponds to the lowest UART on the card, and the lowest in the memory range (1A0h, 2A0h or COM1). Some DOS software I found somewhere on an AST ftp server a long time ago (I forgot where). Don't forget to dedicate the IRQ to ISA in the BIOS configuration setup. Sharing it with a PCI card does not result in an error message (with Linux), but it works really slow (1 character in ten seconds or so). : something must be wrong. Do you have SW3-3 (INT) ON? And do are setting irq 9 with setserial? Worked for me before I switched motherhoards had lost a slot for it. >Some time ago I bought a AST Fourpart card in a DEC repacking. >abstract or a pointer to the manual? INT is on, it is enable interrupt. but if that doesnt work, change the settings again. >look to be fairly easy to remove but can they be upgraded to 16550s? >and SHR. Any idea what these do ? source I can pass mine along. I buy them 20 at a time. Since I buy my Fourports new, I have complete (HA) documentation sets. A summary first (this is how I set mine). IRQx: Enable only one interrupt request (IRQ) line. in your system, configure both for the same IRQ. second operating system that requires COM1 and COM2. (SW3-2 ON). Second board: low address range (SN3-2 OFF). low address range is 01A0-01BFh.